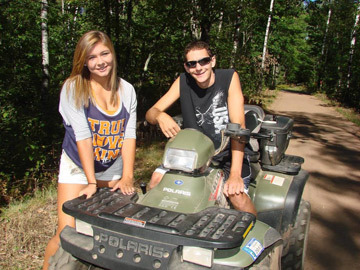 Top O’ the Morn Resort is located in the heart of Bayfield County and is a premier ATV/UTV destination in Wisconsin. With over 180 miles of scenic ATV and UTV accessible trails, and over 1,000 miles of forest roads, this area offers some of the best ATV/UTV riding in the Midwest! Ride directly to the trails right from your doorstep! Our family-friendly, lakeside cabins are perfectly suited for a day on the trails. Take off from the comfort of your cabin and ride into the wilderness. There are thousands and thousands of acres of Bayfield County and Cheqamegon National Forest lands to give riders peace, solitude, and wonderful sense of wilderness adventure. This detailed system of interconnecting trails can take you to a variety of destinations - from scenic overlooks to your favorite restaurant. Take a trip to the Mount Valhalla Recreation Area, check out Amnicon Falls, or head directly north to the shores of Lake Superior. Head south to Barnes, Drummond, Cable, and more. If you're looking to put on some serious miles, Douglas County and Ashland County are also easily accessible. In addition, many of the nearby town roads are now open for ATV/UTV access. Your options are endless! 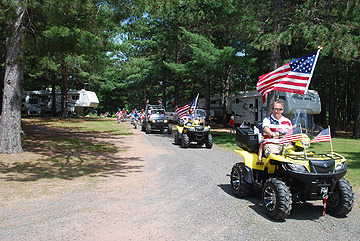 CLICK HERE for the Bayfield County ATV/UTV map. © 2015 Top O’ the Morn. All Rights Reserved.